The year-long excessive fishing caused a big plunge in fish and shrimp catch which is estimated to be about 40 percent lower this year, resulting in seafood export decline by $2.861 million in October this year, exporters said on Saturday. The country”s seafood export stood 8.10 percent lower to $32.449 million in October as compared to the $35.310 million in October last year, Pakistan Bureau of Statistics (PBS) said. 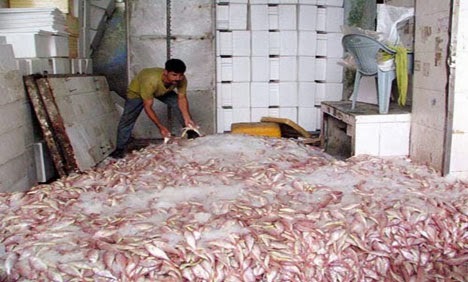 “Overfishing round the year and use of banned nets by fishermen plagued the sea and reduced the seafood crop significantly during August-September period,” said Pakistan Fisheries Exporters Association (Pakfea) Chairman Faisal Iftikhar. In terms of volume, the country”s seafood export also suffered a fall of 2,221 metric tons or 15.13 percent to 12,456 tons in October this year as compared to 14,677 tons in October last year, the PBS said. However, seafood export in July-October 2013-14 increased to $117. 651 million from $98.732 million in the same period 2012-13, depicting a rise of $18.919 million or 16.43 percent. Faisal attributed the decline in catch to continuing fishing activity round the year without any halt to let the sea increase its seafood crop. He termed the fisheries situation “too bad”, saying the government has to act to maintain fish and shrimp stocks in its seawaters. Similarly, in terms of quantity, seafood export moved up to 48,729 tons in July-October this year from 41,851 tons in the same period last year, showing an increase of 6,878 tons or 19.16 percent, the PBS said. Chairman Pakfea said the annual catch at the country”s sea is drastically falling which has its implications when it comes to seafood export. The fall in catch this season is reckoned between 30 percent and 40 percent, which held back the seafood export. “The government is not interested in understanding the annual decline in seafood catch and the banned nets are widely used in the daily operation on seas,” he said, adding that the authorities have to ensure implementation of two months annual fishing ban to help grow fisheries stocks, which are depleting fast.